Welcome to the Mercure Minsk Old Town! We are proud to offer you an extensive range of international quality services to ensure your visit to Minsk is a trip to remember. Mercure Minsk Old Town is located in the historical center of Minsk, which has majestic temples and preserved historical landmarks. The Old Town is a delightful place to walk around in. You can relax in quaint cafes or browse through the souvenir shops. The hotel is close to all relevant business and leisure facilities. Old Town boarders with the main city streets - Prospect Pobediteley and Prospect Nezavisimosty. Nemiga and Oktyabrskaya metro stations are just a few minutes walk away. 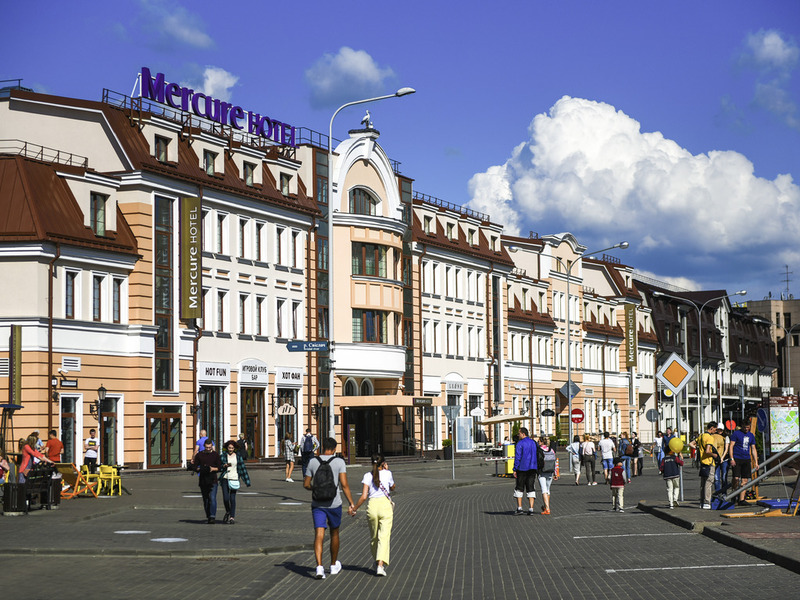 Mercure Minsk Old Town is located in the center of the cultural life of the city. In walking distance there are National Academic Bolshoi Opera and Ballet Theatre, Belarusian State Circus, Belarusian National Arts Museum. Hotel rooms are made in accordance with exclusive brand concept "Local Touch". We serve excellent breakfasts (buffet style) for hotel guests and guests from the city. Busel House's a la carte was developed by an accomplished chef with many years of experience. Mercure Minsk Old Town features a fully equipped 24-hour hotel gym and sauna. Lobby Bar is a place where guests come to relax or have a short business meeting. The Mercure Minsk Hotel's perfect location in the Old Town makes it an ideal starting point from which to explore the treasures of beautiful Minsk. Mercure Minsk features the finest rooms coupled with the highest levels of service and is an ideal base from which to explore the amazing city of Minsk. 127 comfortable rooms with unique design features create a beautiful atmosphere and make each stay memorable. Standard Room with 2 twin beds. Superior room with queen-size bed. Suite with 1 king size bed and sofa. Presidential suite with king size bed, jacuzzi and private elevator. Restaurant of local and international cuisine, perfect breakfast, conference and banqueting menu. After a day of meetings or sightseeing nothing beats a glass of good wine or coffee with light meal menu.